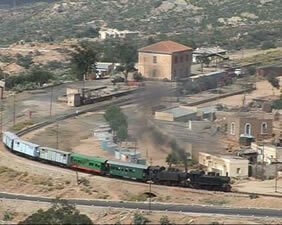 The stunning revival of the railway in Eritrea, with its pre-war Italian 0-4-4-0 Mallets, 0-4-0 Breda shunting tanks and the classic 1935 Fiat “Littorina” railcar, continues to attract those who want spectacular photographs and film/video of this amazing railway, which winds for 117kms from the Red Sea coast with its everybody who had wanted to sample Eritrean steam, had been; but our 2008 and 2009 tours both took just over 30 participants! One of the limiting factors is the capacity of the “Littorina” railcar, but of course we have road transport as well for chasing. Despite the limitations of the Asmara workshops, and the age of the workers there, the older “440” class Mallet is now fully operational, and other Mallets are being restored; the “202” 0-4-0 shunting tanks, for a while out of service, are again serviceable so if you went to Eritrea back in 2002, or even 2005, there is much new to see if you join us again the next time we go. In all probability we will once again join forces with the LCGB, but exactly when is open to question. Firstly the current situation in Calais, where a high proportion of the migrants seem to be Eritreans fleeing tyranny, puts many enthusiasts off – although in fairness, we saw no evidence of tyranny during any of our past visits. But, secondly, the Eritreans are not really helping themselves. A few months ago we were invited to the Eritrean Embassy in London to advise on how tourism in general (including our steam groups) could be improved. Among a number of suggestions and observations, we made two important requests: i) Please find out what is the current situation on the railway – as no groups have visited for some time; and (ii) get rid of the recently introduced rule that all visa applicants must apply in person at the Islington Embassy – and then come again in a few days’ time to collect their visaed passport. No problem for gricers living in London, but a nuisance for those living in – say – Plymouth, and downright unacceptable for those living in countries with no Eritrean diplomatic representation, like Austria, whose gricers have routinely let us handle the visa applications for them. Disappointingly and despite reminders to the First Secretary (who speaks perfect English, so that is not the problem!) no word has been received – other than, in January 2016, yet another invitation to a meeting at the Eritrean Embassy! Needless to say, we will swerve this one! A shame, though, because we would really like to run some more tours here. 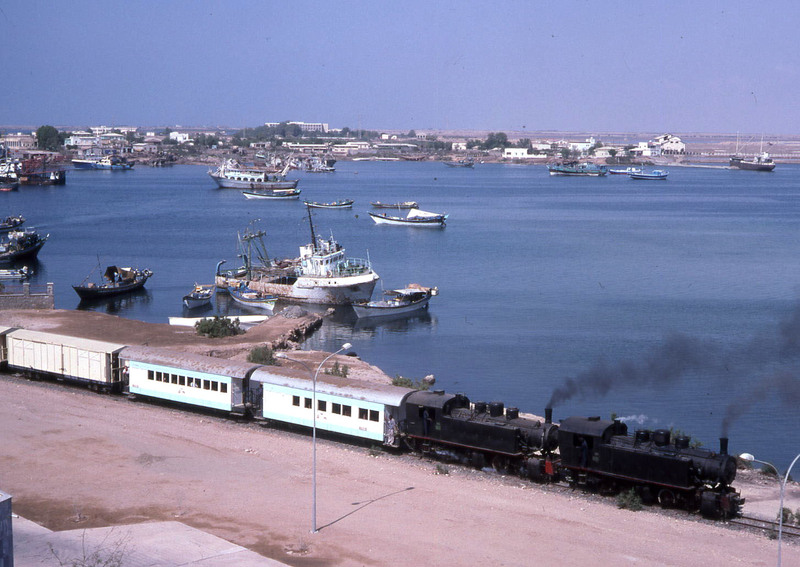 Moreover, Amanuel Ghebreselassie, the General Manager of the railway, whose enthusiasm made these tours possible, has died after a long illness, so it is looking increasingly unlikely that we will be able to run any more tours here, at least in the short term. At the present time it is difficult to get to Eritrea anyway – in 2002, Eritrean Airlines (now defunct) flew directly to London Gatwick. After that service ceased, we had to use Alitalia via Rome, and still later Egyptair via Cairo. Now there are no airlines which conveniently connect the UK with Eritrea. Meanwhile if you want a preview of what you are likely to see, get the Enthusiast Holidays’ video which covers our 2002 and 2005 tours, £14.95 incl. VAT on DVD; and click on the image below for a short clip.